At the bottom of the sampler she has worked various little birds and a collection of teapots and coffeepots as well as a large basket of fruit. Worked predominantly in a palette of green and gold on light colored linen, it is charming in its simplicity. The town of Chesterfield which is named on the sampler is a rural hill town in Hampshire County in Western Massachusetts between Northampton and Pittsfield. The town was laid out in 1739 and sites were granted to King Philip's and King William's war veterans in 1740, but initial settlement of the town did not take place until around 1755. The town center was established after the Revolution with well preserved Federal Period houses along the Main Road and landmarks of civic buildings in a later Greek Revival style. Eliza Ann was the third of four children born to Richard and Olive (Cleveland) Clarke on October 31, 1815. On January 4, 1840, she married Sidney Smith Smead, who was a farmer. After she died on February 14, 1848 Sidney married Ruth T.Thayer and they named their firstborn after Eliza Ann. 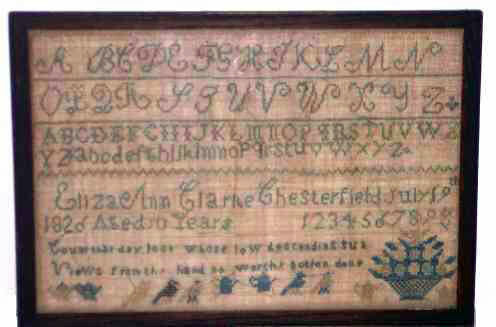 Worked in silk on linen, the sampler is in excellent condition and measures 8" x 12" (sight).